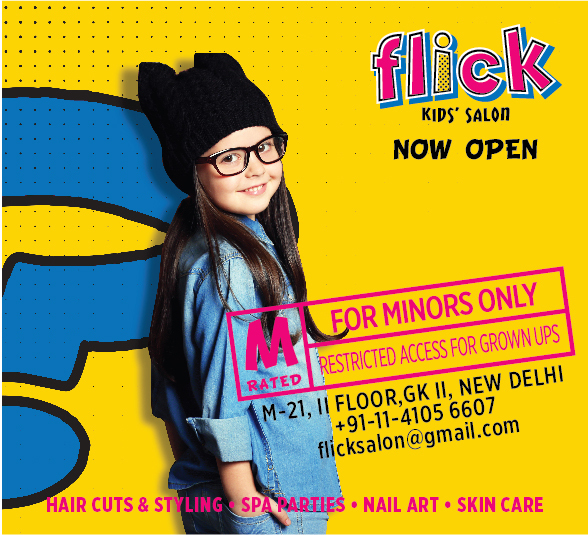 1st February, 2016, New Delhi: Flick kids salon opened its doors today to become New Delhi’s only grooming destination catering exclusively to children aged between 0-12 years. Conveniently located at the main market of Greater Kailash part 2; Flick aims at catering exclusively to childrenfor a range of services, right from special first haircut ceremonies, to hair grooming and cutting as well as spa services to pamper little hands and feet. The most important aspect is the standard of quality and hygiene as well as a well-trained staff equipped to work with children. The co-founders, Deepika Khaitan and SanjanaNath are both experienced mothers &businesswomen and are confident that Flick will resolve a lot of issues faced by parents when it comes to grooming for kids. Deepika comes with a rich prior experience of being one of Delhi’s most admired pastry chefs who has established her credibility for all the work she has done specially for kids under her brand ‘Deepika Khaitan Cakes’. Sanjana on the other hand is a graphic designer and is the brainchild for the entire look and feel as well as branding for Flick and its product range. With the launch of this flagship store, Flick intends to expand shortly into other locations as well as explore other cities via a franchisee model. “These are early days for us, but we are confident with the standards we have achieved with Flick. We look forward to taking the brand to the next level from here.” concluded Sanjana. The bright and colorful interiors are matched with the well thought out furniture as well as enough engaging activities to keep kids busy during the wait for a treatment topped up with a dessert counter which parents and children alike won’t be able to resist. Additionally Flick can be transformed to a special party destination for spa-theme, disco or pyjama birthday parties. Right from activities, to décor and food will be put together by the Flick team. All this and much more is waiting to be explored at the Flick kid’s salon.